= Buchou tte kowaku mieru keredomo tamani akachan kotoba wo tsukatte irutte hisho no Kato san ga itte imashita kedo hontoussuka? = Mawari ni iru hito wa mina donbiki suru. = Kare wa mina ni donbiki sarete ita. = He turned everyone off. = Kore iu to hiichau kamo shirenaikeredomo kare juugosai made okaasan to ofuro ni haitte itandatte. 「どん」( = don) adds the meaning of “really” to a word. Conversationally it is “really”, but it feels a bit like “Bam!” or “Boom!” in English. = Everybody got turned off. = Minani kanari hikare chatta. = Mina ni donbiki sarechatta. = I was turned off. This slang expression gained popularity and now everybody uses it. comedians or comedies. Check 「笑う( = warau) 」lesson! = Sono samui gyagu maji hiku! = the mood or pleasure of the place or people around you get spoiled. = Kare no heta na jouku de ba ga shirakete shimatta. = His bad jokes spoil the mood of that place. = Nagai supiichi wa ba wo shirakesasu. = Long speeches spoil the mood. Note : People who usually turn off people are called, KY ( = kei wai). KY (=kei wai) means those who can’t read between the lines, can’t sense what is happening around you or other people’s feelings. In short, people who are clueless as to how to act in certain situations. Let’s go back to the picture above! Everybody is having a lot of fun at a Halloween party. But out of the blue, Maggie-sensei says she is going to give them an exam in the middle of the party. = Minasan, paatii no tochuu desuga korekara shiken wo hajimemasu! All her students get どん引き ( = donbiki) because it is not appropriate at all and spoiled the party. You’d better not use this with your your teachers. = Minna ga donnani donbiki shitemo shiken wo shimasu karane. = Minmasan wa donnna toki ni donbiki shita? = Everyone, tell me what situations make you feel DONBIKI? Your lessons are very useful, thank you for posting so frequently. I have one question. I have seen this sentence written in this two different ways: 雨が降る and 雨は降る. I would like to know what’s the difference between them or which one is the correct one. Thank you. You usually use が when you simply describe the weather, it is raining/it will rain/ It rained. You use は when you show the contrast. = It won’t snow tomorrow but it will rain. = Why does it rain? first, I want to say that you’re my number one teacher.. Every day, I take new lesson to study and I have all your lessons printed and review them from time to time. I still have so much to study from this site. so why we didn’t say: minna ha kare ni donbiki saremashita?? The cake was eaten by him= keeki ha kare ni taberaremashita. thank you my # 1 teacher..
Konnichiwa Roro! I am very happy to hear you have been studying hard from this site. Ah good point! Yes, that is a direct translation. Since the subject of this sentence is “kare= he”, it may be more natural to translate He turned off everyone. Passive form lesson is coming soon! I mentioned the translation problem in that lesson. Awww how sweet… Thank you for your nice message. So, in that case, if I say: (minna ha kare ni donbiki sareta) , is it right? I know that particle ni comes after the doer, correct me if I’m wrong. sigh~unfortunately, we don’t have teachers.. even if someone is willing to teach, they won’t allow her since none has official teaching certificate. A wa B ni donbiki sareta. Trust me. The simple passive tense is much easier to understand. This particular slang word is more complicated. what makes me feel donbiki ね？For example, when a guy approaches me and one of the first things he tells me about himself is what kind of car he has, how he organizes great parties at his house, or how I m “special” -__-; that really turns me off! I totally agree!!! 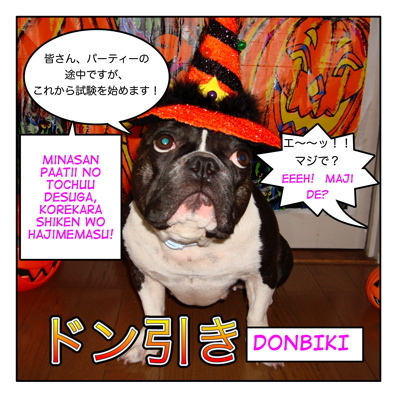 Also マザコン男 is donbiki for many Japanese girls. also, if he keeps bringing up his ex girlfriend into our conversation, and especially if he compares me with her (like “oh anna used to do it like this and you do it like that” or “sarah cooked spaghetti a bit different and I liked that”) that’s a TOTAL ABSOLUTE どん引き !! Oh, no “ex-talk”, either!! You know what? We can go on and on… There are so many どん引き examples in the world! That helps a lot, and it confirms that the way I was trying to understand your example sentence is in fact the right one, and not in the extra example I provided. The trick was in the word ドン引き, then, and not necessarily the “に”. Thanks for the help, much appreciated. I’m enjoying hearing more about these words that I hear from (for example) my students a ton that I’m not quite 100% on. 微妙 was another one, and I was happy to see it a few posts below. Sorry! I went out without finishing my last reply …I wrote it in hurry so it may not make sense but I am glad to hear it helped you somehow. You are right. The trick was in the word DONBIKI. And it complicates more with ~saseru+~ sareru. In a way, it is funny that I have never imagined myself thinking about this word this seriously before. But anyway, it is a fun word to remeber. Older generation won’t understand the meaning though.. Matane! Hello, this is my first time to your site and I’m really appreciating this great information! I will certainly be visiting quite often. Right now the passive voice is something I’m working at, and I am a little confused as to who is being turned off in this statement. Particularly, I’m having trouble with the “に” particle. If you had given me the English sentence and asked me to translate it, I probably would have nearly the same example sentence, except I would have switched 皆 and 彼, (皆は彼にドン引きされていた). Your example sentence sounds to me like “They turned themselves off on him” – of course, I’m not saying that’s wrong, I’m just wondering if my understanding of the word is off. Please help, thanks! Hi! Nice to hear from a new person!! Great question! As I mentioned in my saseru+saserareru lesson,it is not so common to use a passive form in English so I translated some sentences in this donbiki lesson not using passive form to make things easy to understand. Situation-wise, it is the same thing as 彼は皆にドン引きされていた. While the first sentence focuses on his action, the second one describes the situation. If you say 皆は彼にドン引きされていた, that means, “He got turned off by everyone”. If you think ドン引きされた as “Donbiki reaction wo sareta”, it may be easier to understand. Thank you for visiting ABC lesson as well! もろ（or モロ）タイプ　is the most common word to use MORO. Ex. もろ嘘だってわかるよ。(Moro uso datte wakaru yo) = obviously lie, We can tell it is a lie obviously. ABC lesson might have more colloquial expressions than my Japanese learning site. But if you feel like it, please visit there again. You can ask me from any of my sites! Does 起きられなかった mean “not being able to get up”? And what means あったらいつでも? Means if there is anything you don’t understand, please ask me anytime. okirarenakatta : You are right. It means not be able to get up. I couldn’t get up because of Kanashibari. これからも助手のYukariにはしっかり働いてもらわないと！Yukari! Yukari!! Where are you?????? Thanks for the lesson about “Donbiki” ! I think what Larry meant is “how can you type if you are a dog?” Because dog’s don’t have fingers. Even if I am a dog, I know how to use people. I have my assistant, Yukari and she types all the lessons for me. Maggie, can you explain why you write the ‘don’ in ‘donbiki’ using katakana or hiragana seemingly arbitrarily? At jisho.org, katakana is used. Actually I typed them in both ways on purpose so that people can learn them both. I think I mentioned in other lesson but we tend to use KATAKANA for slang. Also young people mix up with Katakana , Hiragana and Kanji freely. There are no rules for slang or new fun words. For example, まじで？　マジで？ ->We use them both. Not just slang or new words, sometimes we write regular words in Katakana to make it look more hip! This must be very confusing for nihongo learners but I think you should know this trend just for your information.